​Welcome to The Sheiling Self-Catering Holiday Cottage Accommodation in Picturesque Scalloway - the former capital of the Shetland Islands. Located on the Westshore in the centre of the village, you will find everything you need for your perfect holiday. The cottage has recently been renovated to give bright and comfortable accommodation. It sits right next to the harbour with Westshore beach only 2 minutes away. 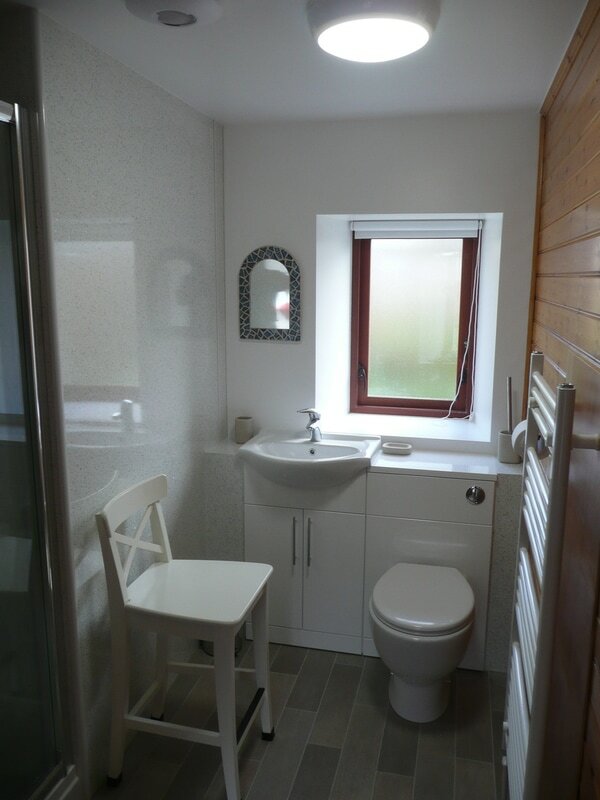 The cottage is fully equipped (including free unlimited Wi-Fi), furnished and decorated to a high standard with everything you need for your ideal holiday. It is easily accessible, single storey & fully modernised. There is an open plan lounge with feature fire place, dining area and kitchen – all with oak flooring. 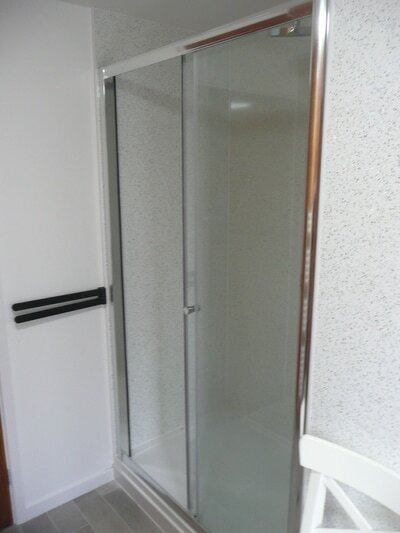 The Shower room has a large (1200 x 800) shower. There are 2 bedrooms – a cosy one with a double bed, and a dual aspect bedroom with 2 single beds. The cottage is designed to be comfortable –and has been furnished and equipped with everything you will need to make it your home-from-home. It has central heating throughout. The Lounge has two leather sofas, a coffee table and plenty of storage. There is also 32” Freeview TV with built in DVD player, DVDs, games, books, local information and travel guides. There is also a double 240 v 3 pin socket with USB ports to charge all of your mobile devices. The dining area gives you a choice. You can choose to eat breakfast at the breakfast bar with space to spread out maps and plan your day; and then enjoy your evening meal on a solid wood dining table, both of which seat four comfortably. The Kitchen is fully equipped with a ceramic hob cooker, a microwave, a fridge with freezer compartment and a washing machine. We provide a kettle, toaster, coffee machine, cafeteries, teapot, all glasses, crockery and cutlery, saucepans, baking equipment, glasses, and even a complimentary bottle of wine. We also provide tea, coffee sugar and milk so you can have a hot drink when you arrive. There is a specialist drying facility if you need to dry out door clothes and boots after a day walking the hills or coastline; sailing or fishing; cycling or driving Shetland’s scenic roads. It can accommodate wet weather clothing for 4 people – with shelves for helmets and hats, glove racks, hooks and sturdy hangers for trousers and jackets, and somewhere for your boots. 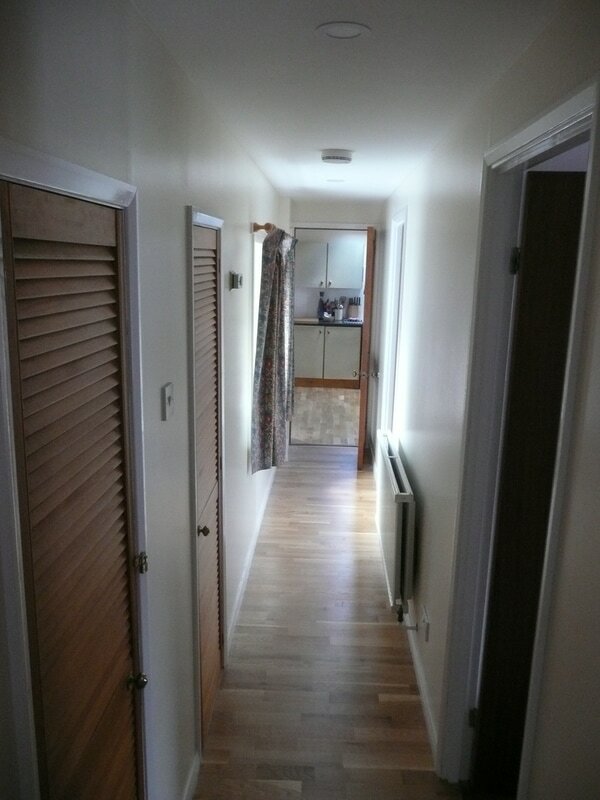 In the hall cupboard you will find a steam iron, ironing board and drying rack for your laundry. There is also a hoover, brush, dustpan and brush, mop and dusters. The Shower room has a large (1200 x 800) shower, with a modern toilet and sink, and a large heated towel rail. We provide towels for all of our guests – face cloth, hand towel, bath towel and bath sheet. The bedrooms are each furnished with two bedside tables, and a wardrobe with hanging space and shelves. Each person has two pillows, a comfortable 13.5 tog duvet and an additional balnket if required. They also have alarm clocks. Both bedrooms have reading lights, 240v 3 pin sockets with USB ports and alarm clocks. There are deep mattresses in the twin bedroom and a memory foam mattress in the double bedroom - both bedrroms are carpeted. There are two outside spaces – one has a small enclosed garden area with a gate leading to the main street – and the other opens onto a courtyard with a drying area and a wooden bench. We can provide off street parking for solo motorcycles or bicycles. Other vehicles can park on the street directly outside the cottage or in a car park 2 minutes away. The Sheiling is access friendly with one small step into the front door, no step at the back door and no steps throughout the property.